Chassis is a mobile robotic beverage delivery system. Remote control allows an operator to drive Chassis as well as operate the beverage spigot and interactive features like eye blinks and Chassis' head-propeller. Inside Chassis is a chilled and insulated beer keg or beverage container and a pressure delivery system to dispense the beverage. A button on the remote control dispenses the drink through the spigot on Chassis' front. An intercom system allows Chassis to interact with people as he is serving: "say when!" Chassis was made from a vintage auto repair lubrication station by Bay-area artists Al Honig and Jonathan Foote. Originally designed to dispense motor oil, we have given him an electronic brain and retrofitted him with a beverage-pumping system using pressurized gas. No need to worry about Chassis' greasy orgins: during construction, he was sandblasted down to bare metal, then a durable and sanitary powder-coat finish was baked on. He was then fitted with brand new food-grade plumbing. Except for that and a few specialized fittings, Chassis consists entirely of recycled or refurbished parts. 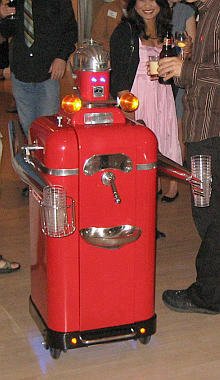 Chassis is available for parties or other human gatherings where drinks are served.